I only got into Les Miserables in 2011 so I am definitely still a novice when it comes to “the greatest show of all times” (as many people like to call it). However, since my first visit I have made sure to catch every new cast to see how the show developes with new takes on different roles. So once again a brand new cast has taken its place on the barricades. Tam Mutu continues as Javert and does a simply wonderful job. He has really made the part his own since taking over from Hadley Fraser in 2012. His Javert is dangerous and determined and his vocals are quite simply sublime. On my visit Daniel Koek was on for Valjean – at that point he was still the alternate but as it turns out he has now taken over the part full-time. I admit I was a bit sceptical after hearing rather mixed views on Daniel’s performance in West Side Story. But I tried to watch him with an open mind, always happy to let myself be taken in of his performing qualities. And I’ll give him this: His voice is quite something – strong and powerful. He hit even the most difficult notes with ease and delivered a quite wonderful “Bring him home”. However, as much as I appreciate a great voice it often just isn’t enough. And for me Daniel is a good example for this. Great singer but seriously lacking on the acting side. It might be just me but I found his acting extremely over the top throughout the show. Yes, Valjean is a part that requires passionate acting but there is a difference between passion and taking every little gesture to the extreme. I ended up being rather annoyed by Daniel’s Valjean which didn’t help feeling any kind of compassion for the character. Na-Young Jeon has taken over as Fantine and she does a brilliant job. Her “I dreamt a dream” was heartbreaking – I loved Sierra Boggess’ version of the song but for me Na-Young took the song to a new level. Such a powerful voice full of passion. Her Fantine is vulnerable yet determined to do what she thinks is necessary to save her daughter. 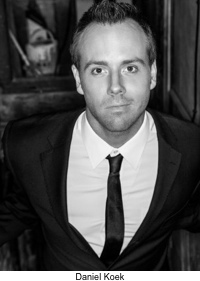 Cameron Blakely continues as Thenardier. He is joined by Wendy Ferguson as Madame Thenardier. 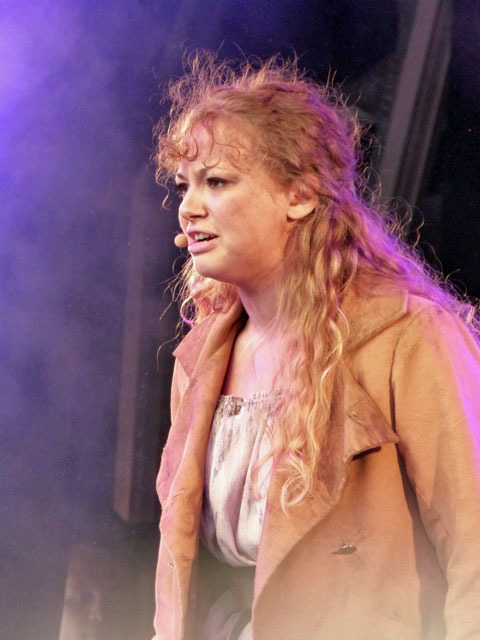 They work well together and Wendy is by far the most “evil” Madame Thenardier I have seen in the show – no wonder poor little Cosette is afraid of her! Carrie Hope Fletcher is probably the most anticipated new addition to the cast. Having played Young Eponine many years ago she now joins the show as Eponine. I have seen Carrie live supporting Ramin Karimloo and Sheytoons so I knew she had a fine voice. Personally I enjoyed her portrayal of the role. I do think she needs to settle into the part a bit more to become a great Eponine – sometimes she seemed a bit too insecure. I prefer Eponine to be a mix of insecure and determined as it gives the character more depth. But I’m sure Carrie’s portrayal will develop in the next few weeks. And as expected her “On my own” was absolutely wonderful. Samantha Dorsey continues as Cosette with Rob Houchen taking over as Marius who is making his West End debut in Les Miserables. He has a good voice and manages to make the most of a (in my opinion) slightly boring character. Anton Zetterholm is who I was most interested to see. I used to follow his career back in the days when he won a tv show in Germany which was set up to discover the leads for the German production of Tarzan the musical. I saw him as Tarzan and always thought he had a brilliant voice. 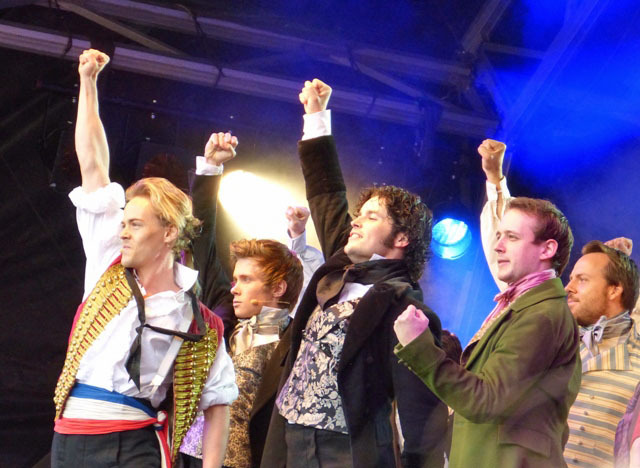 However, I wasn’t sure he would suit the part of Enjolras – to be honest I just couldn’t see this thin and rather young-looking guy leading a revolution. But I am happy to report I was wrong. Anton commanded the stage – his voice was powerful, he was strong and determined and he left no doubt that casting him as Enjolras was a rather brilliant idea. I really enjoyed watching the new ensemble – a group of strong singers and passionate actors. Special mention for the new Factory Foreman (Chris Holland) and Carl Mullaney who just belongs to Les Miserables. His Bamatabois is so wonderfully evil and a joy to watch. Niall Sheehy’s Feuilly stood out amongst the students and really made me want to see his take on Enjolras at some point. All in all I think this cast is stronger than the last cast. But the fact I couldn’t really warm to the new Valjean means I most likely won’t be going back unless his understudy (Chris Holland) is on. Les Miserables is running at the Queen’s Theatre. For more info and to book tickets go to http://www.lesmis.com/uk/. I’m surprised with your reaction to Na-Young Jeon. Her voice was definitely amazing, but I didn’t feel any compassion for her. Oh well, to each their own. She was one of my “highlights” of the current cast. I’m no fan of the part itself and until then only Sierra Boggess had truly convinced me as Fantine. I totally agree about Daniel Koek. I’ve seen the show many times, and this is the first time I don’t enjoy it, mostly because I didn’t believe any of his acting, which felt exaggerated and plain at the same time. He has an amazing voice, but lacks any subtlety to make a likeable Valjean -and to turn such a lovable character into an annoying presence on stage, is really unforgivable. He also made some very weird inflections with his voice, which made some of the text really hard to understand and also killed many musical moments. Hopefully they will change him soon so we can enjoy the show in the West End again.